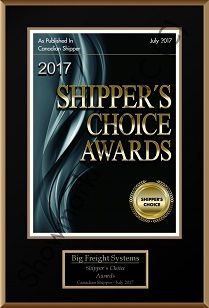 Drivers Awards and Recpgnition - Big Freight Systems Inc.
We have been recognized with the 2017 Canadian Shippers’ Choice Award. At Big Freight our goals and values have always remained the same “On Time Pick Up and Delivery” with world class customer service from our amazing team of Professional Drivers. A personalized custom-ordered Silver Anniversary truck is presented to every driver upon their 25th year of service with the company. The trucks are for the driver's exclusive use and a new truck is presented to the driver every 5 years thereafter. A significant milestone in a professional driver’s career is achieving one, two, or much more rarely, three million miles. Big Freight is proud to recognize drivers that have joined this exclusive club. In recognition of those truly exceptional drivers who have achieved Emerald status for two consecutive years. 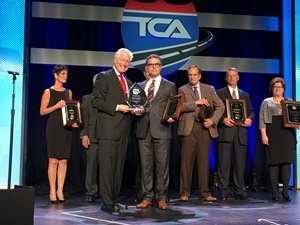 This award is presented to drivers in recognition of outstanding performance in customer service and safe, claims-free driving for the year. This monthly recognition acknowledges drivers for their great customer service and safe, claims-free driving. Selected from the Pinnacle Safety Award candidates, this driver best exemplified the company standards of excellence in customer service and safe, claims-free driving for the month. Drivers who have a violations-free DOT Inspection this month are recognized for their dedication to safety and company standards.